Image: Photo taken before demolition of number 4 Glasshouse on the north side of the works. The warehouse accommodation for number 4 Rolled Plate tank was built in 1946 on the site. 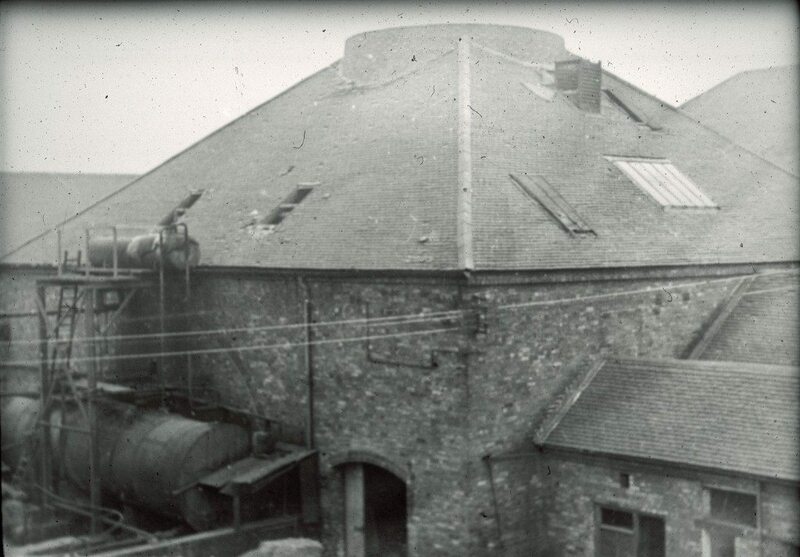 The building shown was constructed in 1834 and is the truncated cone belonging to number 4 pot furnace which was built for making Crown window glass. It was later used for various types of sheet glass making which ceased in this house in mid 1920. The photo shows the outside of a typical glasshouse as constructed at Chance Brothers in the nineteenth century and different to the “English cone” type. Image from: Chance Brothers Glassworks, Smethwick Slides. Broadfield House Glass Museum, Kingswinford, Dudley (Slide and Transcript no 37 by Arthur Reeves).